Welcome to Buffalo Center, Iowa! 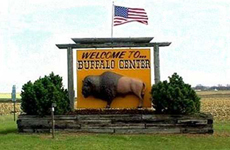 Buffalo Center Development Corporation is a non-profit entity organized to advance the commercial, economic and civic interests of Buffalo Center, Iowa, and the surrounding community. Corporate activities are designed to aid and increase the number of small businesses in the city, and to advance the general welfare and prosperity of the community.